"WAAY-TV, Channel 31, zeroed in on its radio scope and the twister was cutting a savage path into the county. There were those who were becoming convinced that the television station was over-dramatizing and that the situation could not possibly be as bad as reported. Again, Huntsville Manufacturing sirens and loudspeakers blasted out warnings. An eerie stillness prevailed outside. How, some wondered, could another be on its way when the clouds appeared scattered, the winds calm? It was 10:50 p.m. in Huntsville when soldiers at the Army Missile and Munitions Center and School looked out through the blackness to the saddle of Wheeden and Madkin Mountains to the west. A mammoth twister was working its way through the saddle, bearing down on the troop area where more than 1,000 U.S. and foreign troops were housed for missile training. There was little more time than to move to the bottom floors of the multi-story barracks and drop to the floor. . . . .. . . . More than 98 building were either destroyed or severely damaged, but no one was killed. . . . . .the twister struck again near the Patton Road and Drake housing area . . . . MacDonnell Elementary School was demolished . 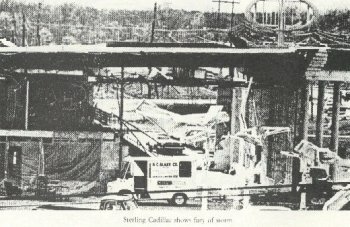 . . . . it smashed into Glenn'll Trailer Court in Southwest Huntsville. . . . .then on a northeast path on Leeman Ferry Road where it cut down everything in its path . . . . At Sterling Cadillac (Drake and Parkway), the twister gutted the building . .... Flipped cars on Memorial Parkway . . .bent utility poles to the ground . . . slashed into the International House of Pancakes on Drake and other side of Memorial Parkway . . . then Parkway City where it ripped much of the southern part of the shopping center apart. Then into Thorton Acres where it ripped roofs, topped trees and smashed homes before moving on. (Note from MDS: it seemed to lift up and passed right over Covemont where MDS III lived on DeRussey and MDS IV lived on Fairmont . . . the tops of huge pine trees were lifted off, but not much damage to homes) . . .
Then on to the base of Monte Sano Mountain. It tore up the forest on the city side of Monte Sano, passed over Monte Sano Blvd. where Panorama crosses at the southern part of the mountain. That's when all the TV stations lost power at 11:05. Sarah Batson's little A-frame house was pretty much gone, but Sarah was hardly injured - - - Sgt. Owens brick house was rotated on his foundation,the roof missing and sat crooked the next morning. The apartments accross the boulevard were badly damaged as were other houses in that area. Oak trees accross the road blocking emergency crews ) The tornado continued for another 18 miles, demolishing woodlands all the way to Madison County fishing lake." Hundreds more were injured and many hospitalized. Another interesting fact..... we had a small tornado the night of April 1, just before the big ones. It tore down the WAAY AM center tower of the 3 tower array and the disk jockey called Cactus at home and told him. Cactus' first reaction was, "Oh Sure, April Fools, right?" It took a while to convince him it was true. Then Cactus called me and I had the same reaction. By the end of the day, I was tired of my kids pranks and jokes on April Fools. I kept thinking Cactus was fooling me, too. We had to rebuild the tower and the tower that came after that, was very strange looking indeed, with the base of the larger tower, but a smaller self supporting one rose back to the 125' level of the other ones. So now, tell me YOUR story. Many of you were involved with the 1974 twisters as well as the 1989 one that tore up airport road apartments, shopping centers and finally Jones Valley school and that area. Pat Spurrier stopped by today and was telling me of the phone calls she was answering the evening in November 1989 from people wanting to help. A man from Georgia called. She also recollects the Ice Storm of February 1985 and the days without power trying to manually do logs and be ready for when power came back. (We installed our generator around 1987 - two years after my father died - he would have really smiled to see that because of that forethought, we were the ONLY station on the air that November in 1989 after about 5:30 in the afternoon and we had 100% of the audience. It was so high, the other stations made the rating services take OUT our ratings that evening to get numbers they could live with. 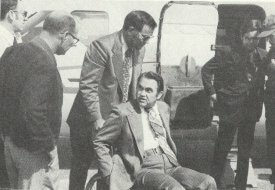 Photos from Mr. Jordan's illustrated book: Gov. 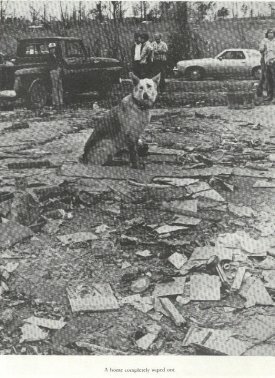 George Wallace, Sterling Cadillac building gutted, Leeman Ferry Road damage and a dog sitting in middle of rubble, no house or dog house. A sequel to the tornadoes of 1974. A few weeks ago, on a stormy Saturday afternoon, the National Weather Service issued a tornado warning for the southern part of our DMA. At the same time, our station's Doppler radar indicated the beginning of a tornado. The meteorologist on duty of course interrupted programming to carry the warning. As it so happened, NBC was carrying the Kentucky Derby at the time. Our News Director and Station Manager both told her to stay on the air until the warning was lifted, which she did. Response was incredibly negative. We received hundreds of phone calls, hundreds of e-mails and stacks of letters from irate viewers who wanted to see the Derby. After a few days of this I decided to be proactive. I personally went on the air defending the decision and made myself available to local press and radio stations. I told viewers that we would always interrupt programming if someone's life was at risk, regardless of how many people it made mad. 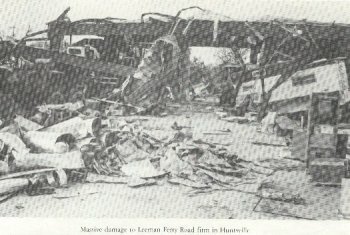 During the radio interviews, I told the story of working at WAAY in 1974 when a series of tornadoes came through Huntsville causing loss of life and tremendous damage. I said I had personally experienced the power of those tornadoes 30 years ago and understood their danger. After starting our "offensive" we began to get calls and e-mails supporting our decision. One thing is for sure, even viewers who don't like us will turn to our station the next time severe weather threatens. It's interesting how some things in our business don't change.